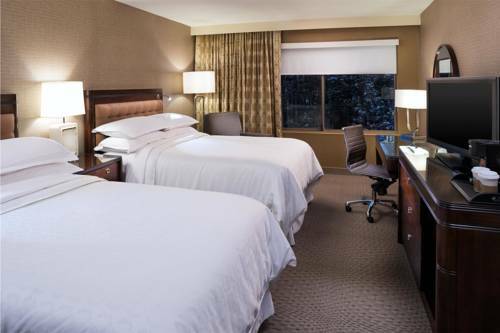 Ideally located near downtown Hartford, off of Interstate 91, Sheraton Hartford South Hotel is a convenient retreat in Rocky Hill, CT. Boasting comfortable accommodations and superb amenities - including a recently redesigned fitness center and an indoor pool - our hotel is an excellent choice for travelers visiting the greater Hartford area. Our prime Rocky Hill location not only places us near the best of the city, it also situates us near many of Connecticut's top attractions, including Wesleyan University. While the many bars and restaurants of Hartford are nearby, we encourage you to dine with us at The Common House, our signature restaurant serving locally- inspired fare morning, evening and night. The Common House Kitchen & Bar: Gather with family, friends or colleagues in The Common House casual setting for your favorite meals. Start your day with a hot breakfast, or wind down over rich pasta or something right off the grill.